Olivia, Alexandra, and I enjoy our ambassadorship with Justice very much. Everything we share is our own true and honest opinion. If you have a tween daughter then you probably know by now that Justice has an ambassador program called Girls With Heart. Over 75 girls from across North America participate in the program sharing digital content and hosting local events with the store. 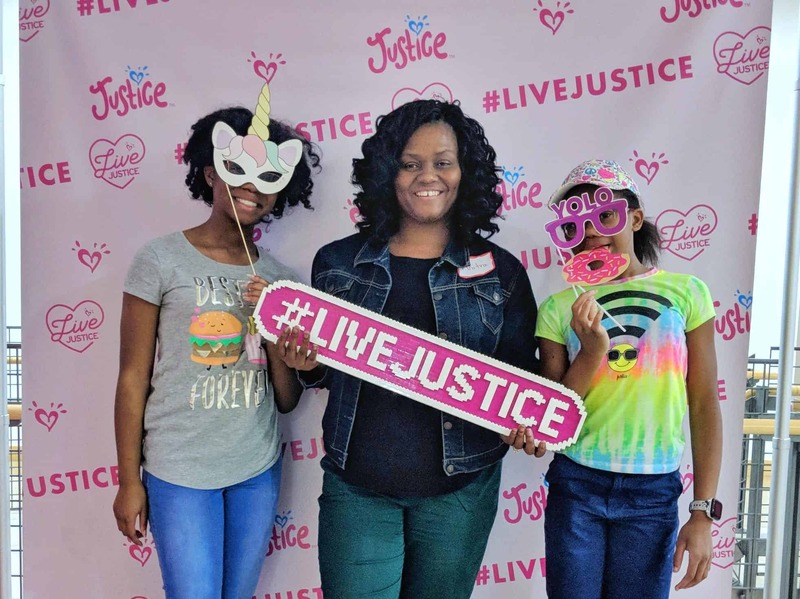 In April 2019 the company hosted the first ever Live Justice Summit, where the Girls With Heart and their parents experienced a weekend of enrichment and inspiration. The summit was held at the retail store’s headquarters just outside Columbus, OH. Olivia and Alexandra have been Girls With Heart since the program began in 2016. They have been invited to do special projects and participate in the annual fashion show at the Brand Conference, but an event like this was very exciting for them. The theme for the Live Justice Summit was Be Unstoppable. Three days of workshops on leadership and creativity began on Friday night with an opening party and registration. Girls were welcomed to the headquarters with great fanfare. On Saturday night girls joined their Ultra Squad and danced the night away in their pajamas. They also met Julia DeVillers, the author of the Ultra Squad books. Be sure to get your copies in store. Sunday wrapped up with statements about what the girls learned over the weekend and a clap out performed for the girls by the parents. Girls and moms closed the day with cookies and milk. For the duration of the summit girls were divided into groups designated by the Justice critters Aleta the Flamingo, Bo the Llamacorn, Wynny the Corgi, and Mei Mei the Pugacorn. Alexandra was on Team Wynny. Speakers for the event led the girls in workshops on entrepreneurship, activism, motivation, self assurance, and living a healthy lifestyle. Maya Penn, designer and artist behind Maya’s Ideas, inspired the girls to create their own Ted Talks. A philanthropist, digital animator, and designer of an eco-friendly clothing line she has already delivered three (3) Ted Talks at age 19. Jess Ekstrom, founder of Headbands of Hope, led the girls in a workshop on imagining the world the way they wish it would be. From there she helped them create a business plan to launch their own business based on their passions. A team from Girls on The Run™ led the girls in workshops on what makes them feel individually unstoppable and how they fit into the larger community around them. For this event, parents were required to attend and participate. Even though we got to sleep in a little longer than usual, we also had meaningful workshops with official Justice partners. Lego led us in an interactive workshop on learning through play and how using six simple blocks can teach a wide variety of skills – both academic and developmental. Nationwide Children’s Hospital is also an official partner. We learned all about the awesome ways they serve children and their families when Olivia filmed her Live Positively video at the hospital. Our workshop focused on the #OnOurSleeves campaign and website they will launch in May sharing resources, tools, and education for parents and families of children with Behavioral Health diagnoses. Justice is committed to helping girls around the world embrace the things that make them unstoppable. Look forward to more opportunities to Live Justice coming in the near future.